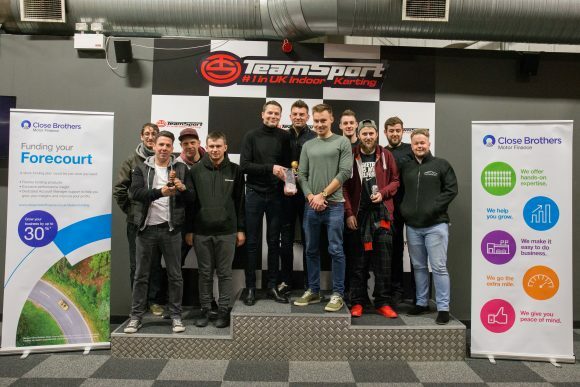 THIS WEEK saw the return of the Car Dealer Magazine Go-Karting Challenge in association with Close Brothers Motor Finance. 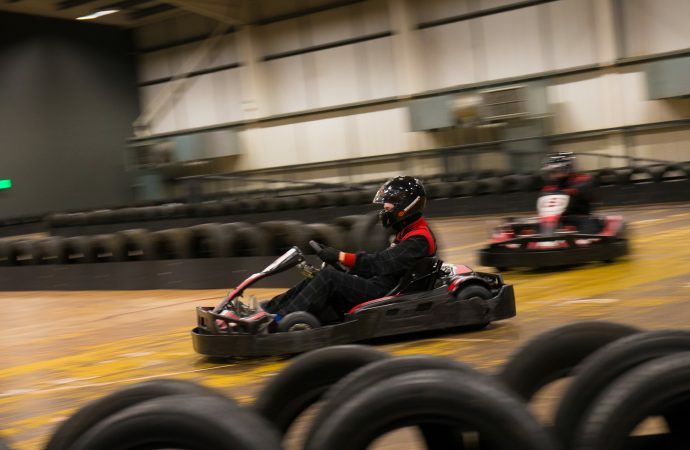 This third round would take us to Essex, and the TeamSport Karting track in Basildon. Ten teams lined up on the grid, and when the 90-minute race fired into life it was ultra-competitive from the start. The grid was made up of experienced karting racers from Essex and the surrounding counties – all with the podium in mind. The Selective Motors Direct and Essex Auto Group kart #6 with Harry Pritchard behind the wheel took first position off the line and the remainder of the pack battled for position while they extended their lead. By the end of the first driver switch, the #2 kart of Your Best Car had taken the lead but in the pits motorcycle dealers Dobles, Fins and Hythe Hill in kart #5 and Selective Motors Direct both overtook them. It was only a couple of laps more before these teams had to pit and #2, driven by Andrew Woolger, jumped back into the lead. In the thick of it with the pack leaders were the Car Loan Company in kart #1 and Allen Ford in #9. The fastest lap times kept coming down in what was arguably one of the cleanest but hardest-fought races of the Go-Karting Challenge yet. The final half-hour of the race was nail-biting stuff as kart #6 swapped in Ricky Carr, who set the fastest lap of the race, and soon jumped the motorcycles team’s Joe Brown, putting them into second. With only minutes to go, the top three karts raced to the finish line for the top spot on the podium with less than a lap between each of them. The teammates on the sidelines held their breath in the final seconds but it was the #2 kart of Your Best Car that kept hold of the lead to the very end, finishing with the most laps. Josh Brown of Your Best Car said: ‘All of us kept the pace up throughout the race. The pit stops were quick, the corners were quick, and that really benefited us when we were being chased in the final laps. Team Your Best Car and team Selective Motors Direct/Essex Auto Group now go through to the final in Reading on March 28. There’s one more regional heat – in Bristol on February 20 – where the last two finalists will be decided. Sign-ups for the Bristol event are being taken up until January 31. You can contact us on karting@cardealermagazine.co.uk – and thanks to the backing from Close Brothers Motor Finance, there are no entry fees!